If you own a home or a business in Apex NC, you may find yourself in need of pressure washing or power washing to keep your property looking beautiful. The exterior areas of your home or business are the first thing that people see, so keeping those areas clean is a great way to make a first impression. Peak Pressure Washing in Apex, NC, will help keep your exteriors clean of dirt, mold, mildew, and other grime. We use a LOW PRESSURE exterior wash system and we start with an eco-friendly layer of soap that is tough enough to remove dirt and grime from stucco, hard wood and other exteriors. We then use a low pressure rinse that is guaranteed to make your home or business clean, without any damage. For all of your pressure washing and power washing needs in Apex, get in touch with the home cleaning experts at Peak Pressure Washing. Pollen, dead leaves, algae, mold and other substances can make your roof look dirty. This is in large part because your roof is exposed to dirt and debris year round. 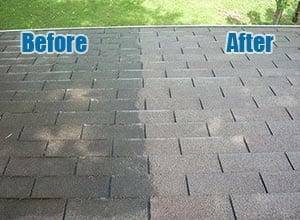 If your roof has a stain or is dirty in general, you can count on the roof cleaning experts at Peak Pressure Washing to provide low pressure power washing services that are guaranteed to remove dirt, muck, and grime without damaging your roof. We provide commercial and residential roof cleaning services to customers all over Apex NC and the Triangle. 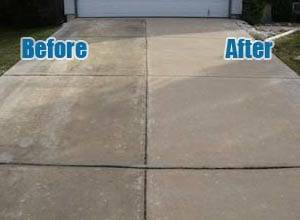 Does your home or business have concrete areas in your driveway, patio or anywhere else? If so, you may have noticed that oil, grease, rust and other stains may become noticeable over time. Peak Pressure Washing in Apex has the skills and experience you need to clean your commercial or residential concrete exteriors. Our pressure washing & power washing for concrete in Apex NC, will leave your driveway, patio, or masonry looking clean and beautiful quickly. Homes, Condos & Apartments often have decks and patios. 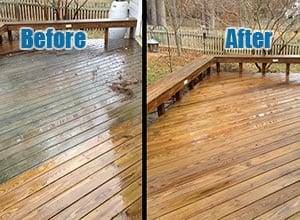 During the course of the year you may have that your deck or patio is in need of cleaning. You may run a service station or gas station with a dirty sign or awning for the same reasons. At Peak Pressure Washing, in Apex, we can clean your awnings, signs, decks & patios with a low pressure power washing system that wont leave any damage as it cleans. During Autumn, the gutters in your home or business in Apex NC may become clogged from leaves, dirt and other debris. 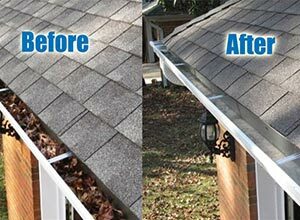 The outsides of the gutters can also start to become dirty and in need of cleaning. 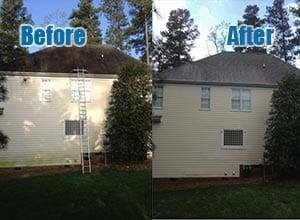 Peak Pressure Washing in Apex NC, has the pressure washing tools you want to help keep your gutters clean and free of debris. Talk to us about our low pressure gutter face cleaning solutions in Apex NC. Peak Pressure Washing is your source for commercial & residential low pressure power washing services in Apex. We proudly offer our pressure washing & power washing services in Apex,Cary, Raleigh, Holly Springs, Fuquay Varina, Clayton, Durham, Garner, Morrisville, Knightdale, Wake Forest & beyond.